There are some photographic images that appear to remain embedded in my mind for a very long time. Sometimes these are retained simply because of a personal interest in the subject, such as the stark but beautiful portrait of the Irish playwright Samuel Beckett by Jane Bown, or the 1946 image of Gandhi, Nehru and Sardar Patel in close conversation by Kulwant Roy. Others impose themselves because of the sheer horror of the stories they represent, as is the case with many of the works of Don McCullin taken in Vietnam or the image of a drowned Syrian child who was simply looking for a safe and better life when he was washed up on the shore in Turkey. A couple of days ago my mind was taken back to a chilling image from 1989. A solitary man stands before a tank in Tiananmen Square in Beijing; he holds a bag in his left hand, as if he has come straight from shopping at the local market. We cannot see his face, but instinctively we know that if we could we would recognise fear, but also bold defiance as he makes his protest and expresses his disgust at the oppression of a brutal political regime. In her excellent and horrifying book “The People’s Republic of Amnesia,” Louisa Lim visits survivors of the Tiananmen Square massacre, and the parents and friends of those killed by the Chinese regime, many of whom had never previously seen this famous image of the anonymous individual who has simply become known as “Tank Man.” Even today she found many who would not talk about the photograph or did so only in circumstances where they were sure they would not be seen or overheard. The reason that my memory brought back this powerful picture so recently was the publication of a similar image of a young black woman named Tess Asplund that was published in the Guardian newspaper on May 5th, and no doubt in thousands of other newspapers around the world. 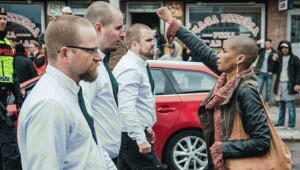 In this picture an individual lady, once again with a bag at her left side, stands defiantly before a hostile crowd of racist neo-nazi marchers on the streets of Borlänge in Sweden. The self-styled Nordic Resistance Movement has gained momentum in Sweden despite the numerous racist and anti-semitic outpourings of its shadowy leadership. The photographer David Lagerlöf has captured the bravery and defiance of his extraordinary subject as she stands in the middle of a road silently but powerfully confronting those who hate her because of her colour, her culture and her opposition to their narrow view of the world. I am not convinced that she is correct when she says that anyone can take such a courageous stand. Hers was an act of bravery which should be seen as a motivation for all who oppose racism or other acts of collective violence, but I wonder if I would have the courage to behave as she did? The action taken by Tess Asplund gives a powerful message. But let’s imagine that the photographer David Lagerlöf had not been present at the moment. How many of us would have heard of this solitary act of defiance? Photo-journalism, as with other forms of reporting can play an important role in communicating not only the news, but also the best and worst aspects of humanity. This is why the image of Tess Asplund, along with that of Tank Man, and many others which depict the human spirit at its strongest will leave an indelible mark on many of our minds. A learning bridge between Europe and Asia that needs to be maintained. What can we learn in one minute fifty seven seconds? Getting things off my chest! Bushra Anis Naqvi on Let not the facts get in the way of a “good” story. Richard on A learning bridge between Europe and Asia that needs to be maintained. Pushpa on A learning bridge between Europe and Asia that needs to be maintained.